Please find attached some Chassidus and Kabbalah on Maseches Tamid, Daf Chof Hei Amud Beis-Chof Vav Amud Aleph. I don't know much about him. He was quite the zealous type. True to this pedigree. 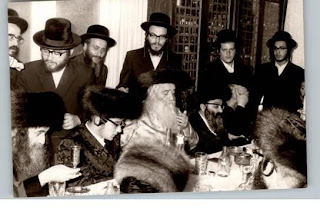 He was 94 years old, so he still saw R' Avrohom Ber Ilyer as a bachur and was mekabel from him. The picture is from a demonstration (in 1980?) against the State of Israel, where he spoke in English for the press. 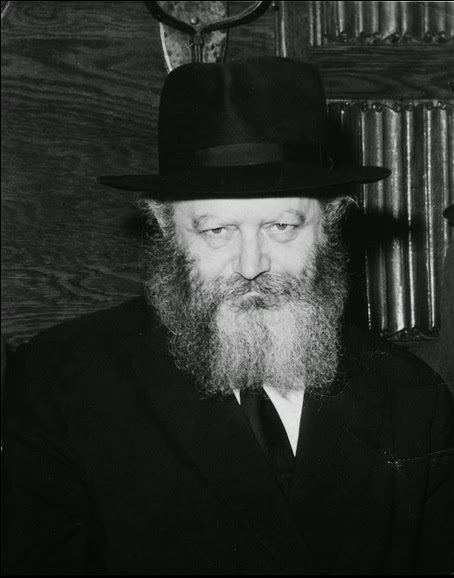 His "love" of Lubavitch was legendary. 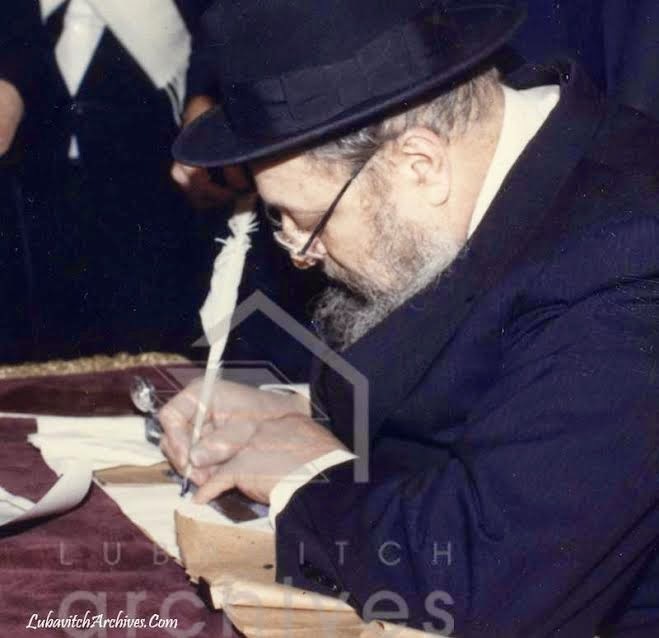 He would cross out the Rebbe's name from Chabad seforim like Tanya and Alter Rebbe's Shulchan Aruch well into his old age. Some of his children are even more extreme than him, some even joining NK. 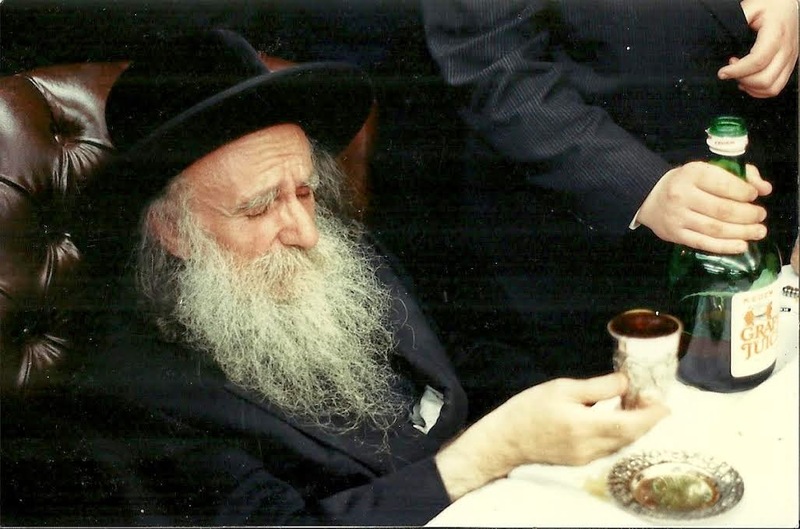 Let's see if we can make sense of this: The late Amshinover Rebbe of Boro Park, pictured here below took an eydem, a Rabbi Yossel Ernster, son of Reb Moshe, nephew of Reb Mottele Vizhnitzer and grandson of Reb Chaim Meir'l of Vizhnitz. The second pic seems to be from that wedding. Rebbetzin Ernster was a daughter of Reb Chaim Meir'l. That would explain Reb Mottele's visit to Amshinov. But the question is how these 2 got together in the first place, ווארקא מיט וויזשניץ איז chalk and cheese, if you get my drift. Blood is family. Family and friends. Water is, well, I'm not quite sure what water is. I guess it means acquaintances, fellow bloggers... I'm not here to attack or "expose" Reb Sucher. His story is well-known, and he makes no bones about his past life. And you might say that I can very much relate to him, the defending his old friends part. There were several occasions lately where I could've written about stuff in the frum media, but I knew that the people who would REALLY enjoy it are the haters, and why give them fodder? And you might say that I admire his courage to stand up and defend his people. Especially if they're (read: Tablet magazine) just hocking. This despite the fact that Tablet is using the same kind of logic Reb Ysoscher would use on any other topic. But אלץ האט א שיעור. ביז צו די פופיק. I can write about these topics, not you, Tablet Magazine! So maybe there's hope for Reb Ysoscher, after all? אפשר וועט ער "קומען צום שכל" און צוריק ווערן א היימישע איד? Rav Shlomo Zalman Horowitz z"l was the Rav in Potok-Zloty, Galicia before WW2. 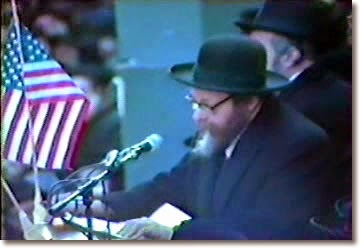 To bring it closer to home, he was - As far as I remember - the father of Reb Shmeel Horowitz, the Bobover Ruv's Gabbai. Here he tells David P. Broder about his experiences during WW2. It's quite eye-opening. The reader who sent this link to us tells me that it's interesting to hear what he thought then of an impending Jewish State in then-Palestine. א חרד'ישע איד וואלט היינט נישט אזוי גערעדט, ווייל ער וואלט מורא האבען אז מ'וועט אים נאכשרייען אז ער איז א ציוניסט. Who was ד"ר ב' קאהן and why was his name removed from the שו"ת ויען יוסף ? 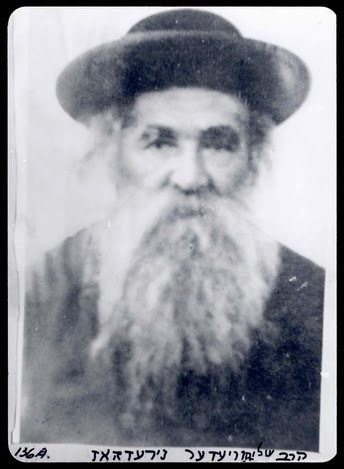 If you look back at the Luach Pupa 1943 that we published this week recently you'll see the name ד"ר ב' קאהן mentioned as a source for zmanim, since he was a בקי in Astronomy. Makes perfect sense. Not much thought went into worrying about his Doktor Rabbiner status or which kehillah he belonged to - שטטוס קוו או ארטאדאקסית - he knows his stars so he can tell us when night falls. Yet as much as we think that we're continuing our glorious European traditions we seem to be VERY self-conscious about much of what went on there! 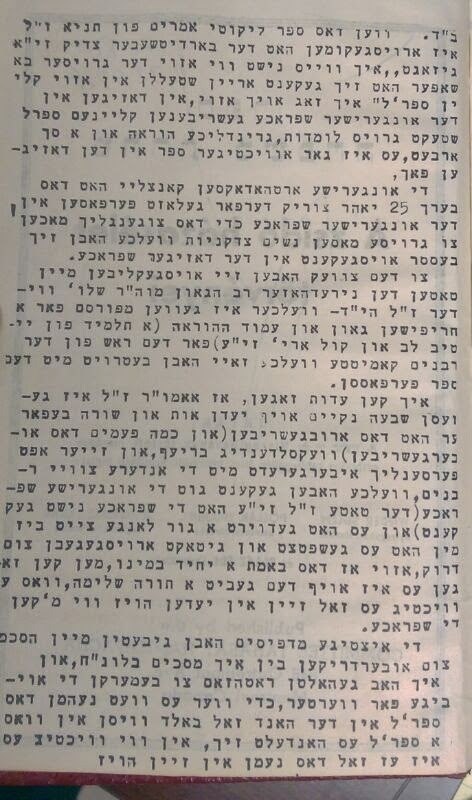 At least twice in the new edition of ויען יוסף where they quote לוח פאפא תש"ג they omit his name and the fact that he was an "אשכנזי" - i.e. a learned Yekke. 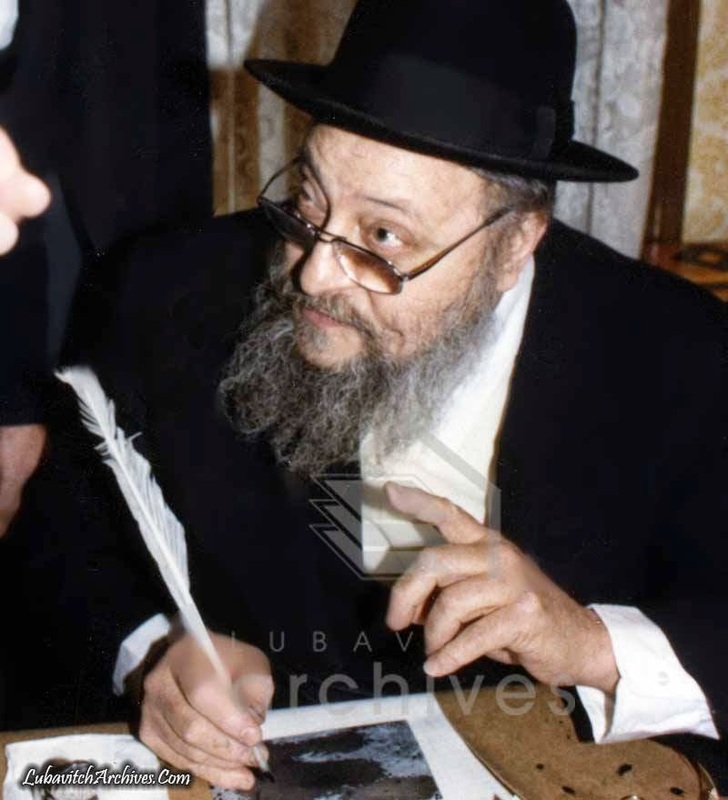 What do today's Pupeners know that their esteemed Rebbe and mentor didn't? Why was it good enough for him and not for the folks on Bedford Avenue? 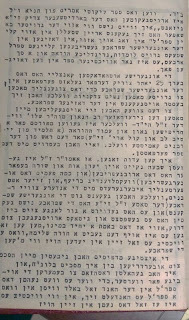 See the final paragraph in the attached file, starting from ולענין זמן צאת הכוכבים. So, as far as the question we ask in the title: why was his name removed from שו"ת ויען יוסף, I guess we're protecting our children??? Who was Dr. B. Kohn? 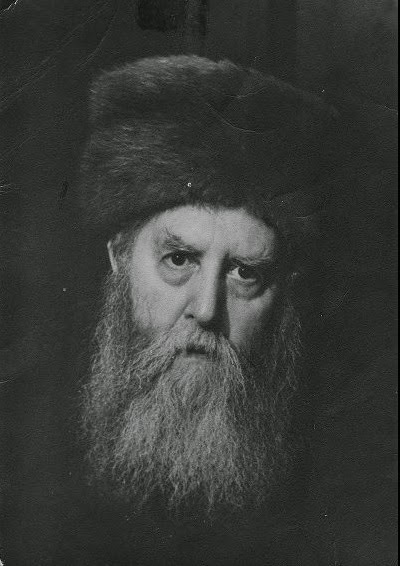 see 'סימן ל for a תשובה from Rabbi Dovid Tzvi Hoffman to the good Dr. Rabbiner. Sometimes important milestones or stories go by unnoticed here, where in the past we'd surely have covered them. That's due either to lack of time or information, or both. Or sometimes we think that either you guys wouldn't be interested or would miss the point. In the case of Rabbi Zirkind lack of time and information at the time of his passing was the factor. And usually it's עבר זמנו בטל קרבנו, but not in this case! We'l make up for it now! 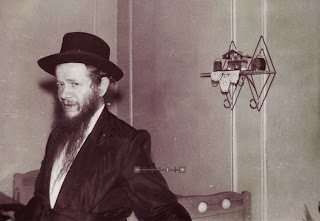 I don't think I ever met or even saw Rabbi Zirkind, despite having been around Lubavitch and 770 for quite some time. But that's often the case. You can go through life and not meet people that spent many of the same occasions with you. But here I think it was more of an intentional low profile being kept which kept him from being recognized and known by many in the younger generation. 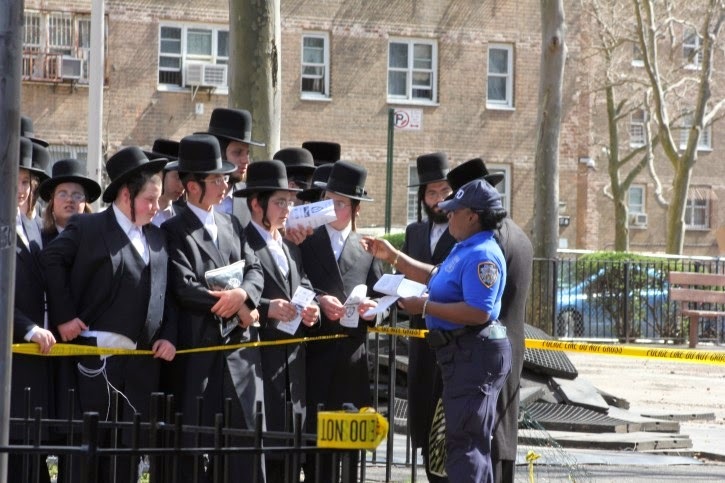 Having said that, everybody knew that there was a father to all those Zirkind children somewhere in Crown Heights. The father runs a very tight ship. He lights candles at like chatzos or plag haMinchah on Friday afternoon. He doesn't step into Oholei Torah on Eastern Parkway or send his kids to school there because it was a Conservative temple. 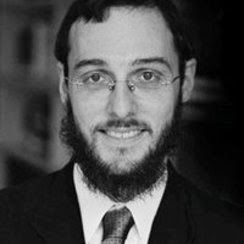 He wears "Polish style Chassidic clothing" as the website Collive so "eloquently" put it, and so do his children and grandchildren, something most unique in today's Lubavitch. 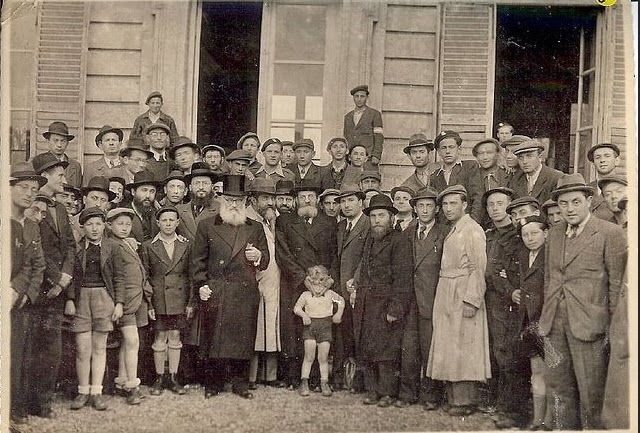 He was the founder of the Zirkind "shevet," if you will, all very recognizable. Others made mention in the obituary, if you will, of the fact that he was drafted into the Korean War and had his beard forcefully removed because it was against Army regulations, while being held down by 5 guys.(!) 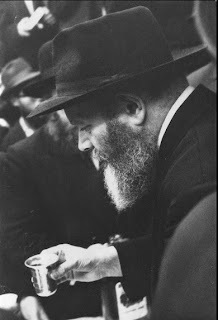 Or that he would translate the sichos to English-speakers who could not understand the Rebbe. Or that he reported all his cash earnings to the Government! But you get the indelible feeling that this only scratches the surface. That it's בבחינת מגלה טפח ומכסה טפחיים. I just don't have the answers. Maybe you all can fill in the blanks? 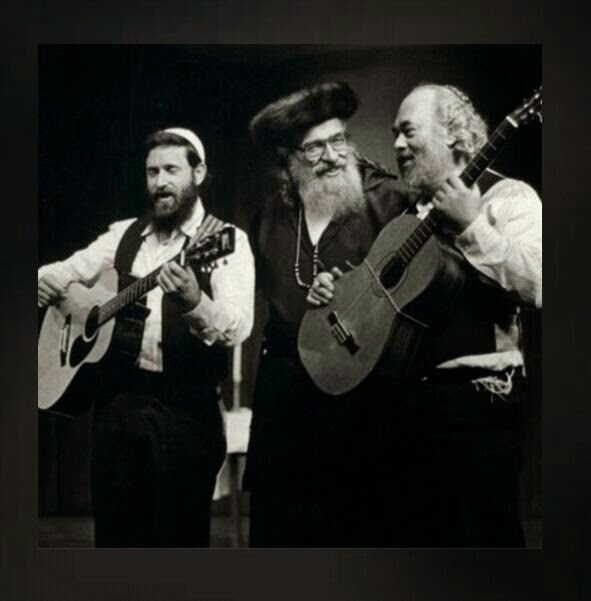 CR: Whatever is done in willy becomes Heilig and Heimish, since they buy the most G&G long suits in our doir. 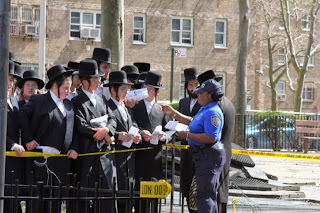 Imagine if the NYC housing projects would've been in any other Yiddishe neighborhood and Jews would utilize it for their cheap shelter, then the shprach in Willi would be, nebach on these Jews who expose their kids to Sedom Ve'Amora. The Beach in Eilat is 1,000 times eideler than the projects, ask the kids that lived in Clemente or Wyhte Place, the corridors are brothels, officially. But since the Heimeshe live there it is the norm. This is their attitude and obviously their leader is in the same drekk. Imagine if [Mayor] Barakat [of Jerusalem] would build these projects in Meah Shearim, they would holler in protest for years to come, like years ago with the pool in Yerushalayim. Funny how we never think of it that way. We had a rebbes in Spinka kheyder kita gimmel and daled who lived in these projects, and once a year, on Purim night, we would go deliver Shalikhmoones to our kheyder rebbe. It was a חויה for us Boro Park kids to go to holy Williburg bikhlal. Willi - in our minds - had the REAL holy Jews living there. Not like in BP. We yearned to be more like them. But I gotta tell you, it was weird going up there. אין באראפארק האט מען נישט געוואוינט מיט גויים אזוי אין איין בנין. There were a few kids who lived in Apartment buildings, but that's not public housing. But we sometimes do strange things in life if we convince ourselves that it's OK. Or if it helps out get through life just a little bit easier. 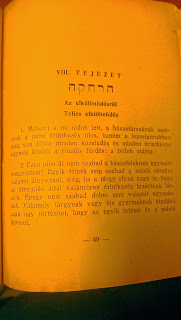 Like the title here says: Heimish is as Heimish does. If it's the norm and accepted we usually don't give it a second thought. בבחינת the grass is always greener on the other side: The Amshinover Rebbe zt"l says in the shtikkel "המחלוקת גרועה מהכל" on page 1 that the Ungarishe Yidden had less makhlokes, and therefore the שטן didn't have as much כח there as he had in פולין. 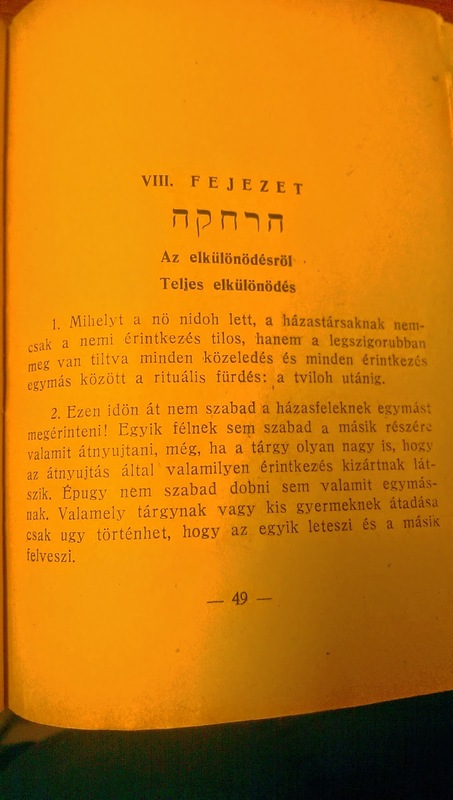 Unless he knew something that we Hungarians didn't know about פולין. Was מחלוקת so bad in פולין pre-WW2? Was it Ger vs. Alexander? Ger vs. Everybody Else? 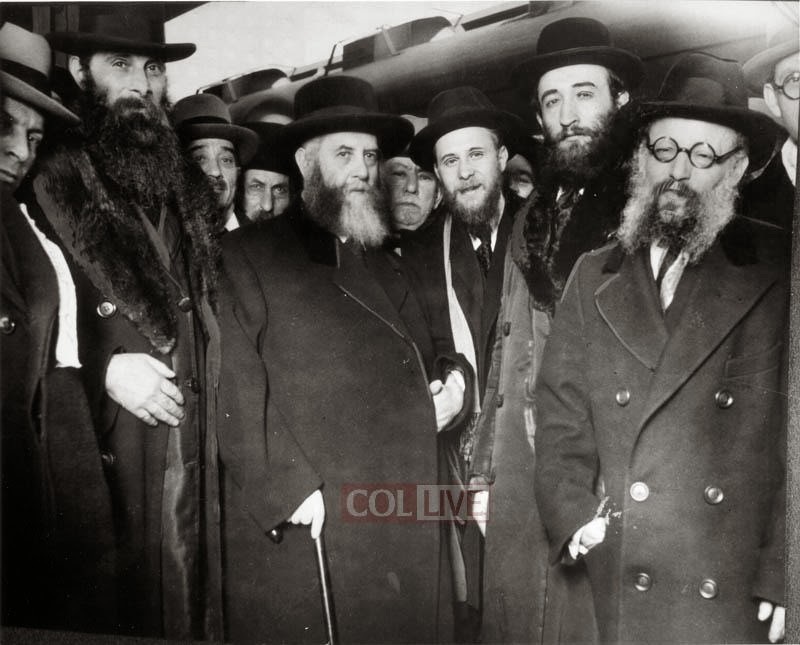 Meileh if he would say that the matzav היהדות was better in Marmures than in Poland איז ניחא. But just מחלוקת? Can anybody enlighten us here? 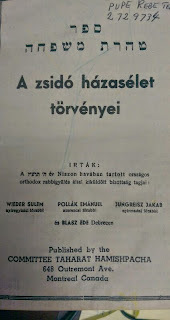 We once spoke about sifrei kodesh published in Hungarian pre-WW2 and how we were surprised to see it. We thought that despite the fact that we have our Bubbe's צאינה וראינה in Hungarian that in circles such as Pupa, this wasn't done. At lest that's the way Pupa would portray itself today... That's what happens when you live in Satmar's shadow for 60+ years... Then again the whole issur against foreign languages is a bit unclear. Was it only in shul that it was assur? Only drashos so as to separate from the neologen? 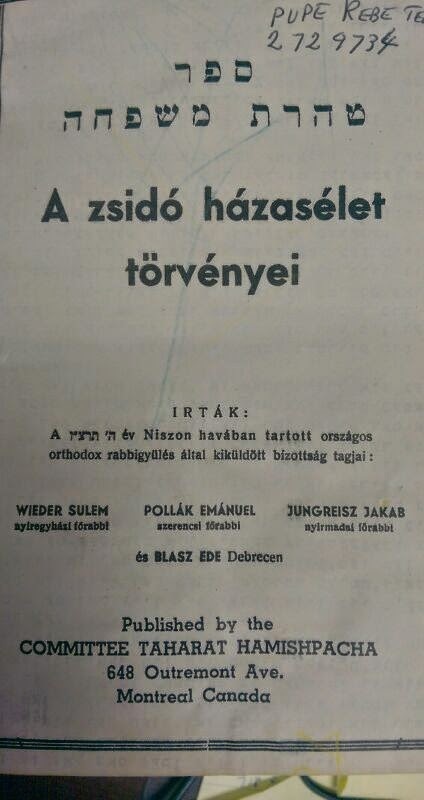 In some shuls it was assur to speak Hungarian, which shows you that Hungarian was the language of choice and that they wanted to uproot that minhag. 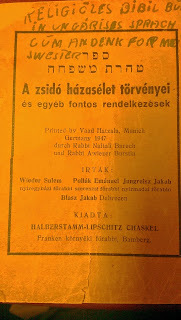 In any case we have for you today, courtesy of veteran reader Yosef718, several pages of a book that was published by HaRav Shulem Vider הי"ד of Nyíregyháza pre-WW2 and then reprinted in 1947 by the VH in Munich, and then later in Montreal. On the VH copy a woman remembers her sister, and in the Montreal copy a different woman had scribbled the telephone number of the Kicsi Pupa Rebbetzin, o"h. The hakdomoh in Yiddish is from his son Reb Shlomo Dov Vider of Montreal. 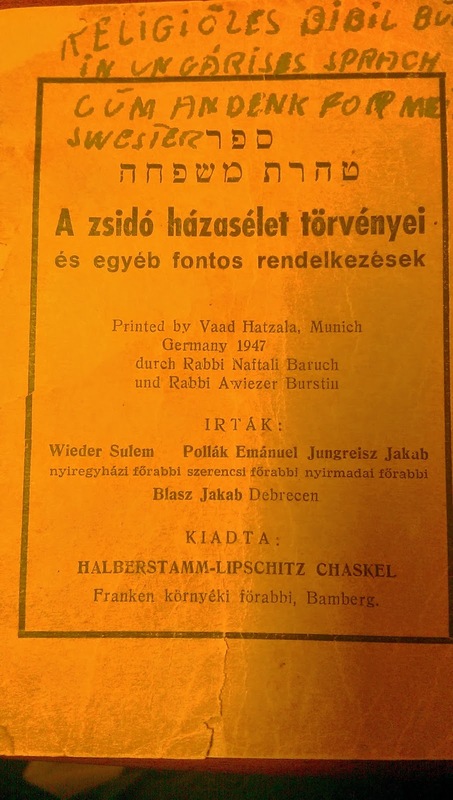 There he writes that the Orthodox קאנציליי, gatekeepers of the Teilung, if you will, original teilung organizers, were the ones that had this published. Photo courtesy of Yad Vashem. In honor of Yud Bais - Yud Gimmel Tammuz, Chag HaGeulah, please find attached Chassidus Metzuyenes on the Ma'amar of the Rebbe Rayatz "Tov Shem Mishemen Tov", which he said just 2 months before his imprisonment. Due to the desire to share this Ma'amar, I am sending it out even though the notes have not been completed. The Ma'amar was said on Bais Nissan, 7 years after the Histalkus of the Rebbe Rashab, on his Yahrzeit. There are many open and hidden references that the Rayatz refers to his father the Rebbe Rashab as the 7th from the Besh"t , the Moshe Rabbeinu of the Dor, and his Koach of Mesiras Nefesh. It would be fair to say that the content of this Ma'amar was later a tremendous support for the Rebbe Rayatz and it gave him extra Koach to be Moser Nefesh for Chassidus, as a continuation in his father's footsteps. It is a great zechus to learn this Maamar on Yud Bais-Yud Gimmel Tammuz, and may it speed the way for the Geulah Shleimah. May we hear Besoros Tovos, especially from Eretz Yisroel. here it is! EXCLUSIVELY ON CIRCUS TENT!!!! הנה הגענו יום עברה יום צרה ומצוקה יום שואה ומשואה יום חושך ואפלה וכבוד מעלתו שליט"א הרצה דברים להבהיר ולהאיר עיננו אך במחילת כבודו עוד הוסיף ענן וערפל. וכבר ניבא צפניה התקוששי וקושו, וחכמינו ז"ל דרשו קשוט עצמך ואח"כ קשוט לאחרים. כלומר: ילמדינו רבינו; מה שטען היתכן לדור במקום סכנה, הלוא בוויליאמסבורג אך לאחרונה חטפו את ר' מנחם שטארק ז"ל הי"ד. זכור ימות עולם, הרי אבותינו ורבותינו נטלו בידם מקל נדודים להימלט בעוד מועד מאיירופא ארץ הדמים טרם פלישת האויב. ובאמת הורי הנהרגים, וכן רבים מהשוכנים במקומות סכנה מחמת דוחק ויוקר מקום דיור בארץ הקודש, הלוואי ידרוש נאה ויקיים יאה לעזור להם לרכוש דירות בקרית ויואל משה בירושלים ובבני ברק. He is very fond of soundbites. One of them was publicized last week. That we are a nation of נרצחים (murdered ) but not רוצחים, (murderers) regarding the Arab boy that was apparently killed by Jewish boys. Did the holy Rebbe get up and condemn the incident that happened in his brother in law's fiefdom a few kilometers from his residence? Did he condemn the whole establishment of Skver for instigating a boy to burn down a house full of yiddishe kinder? Did he keep quiet because it is Sosha's sister's husband? He would rather make a statement that will makes waves universally than messing with his family. What about the story of people very close to him who shall for now remain nameless burning down a home for mothers and newborns (ילד שעשועים)? Is stirring up globally against millions upon millions of אחב"י easier and geshmaker? Food for thought for the day. This is not some attempt to sanitize Zalman, although his life is not just as simple as "he freid out, end of story." I just found some good stuff on his collection website and would like to share. The ones I'm sharing pertain to Lubavitch and are images that are either never-before-seen, or rarely seen. The ones of him and his family you can go there and see for yourself. 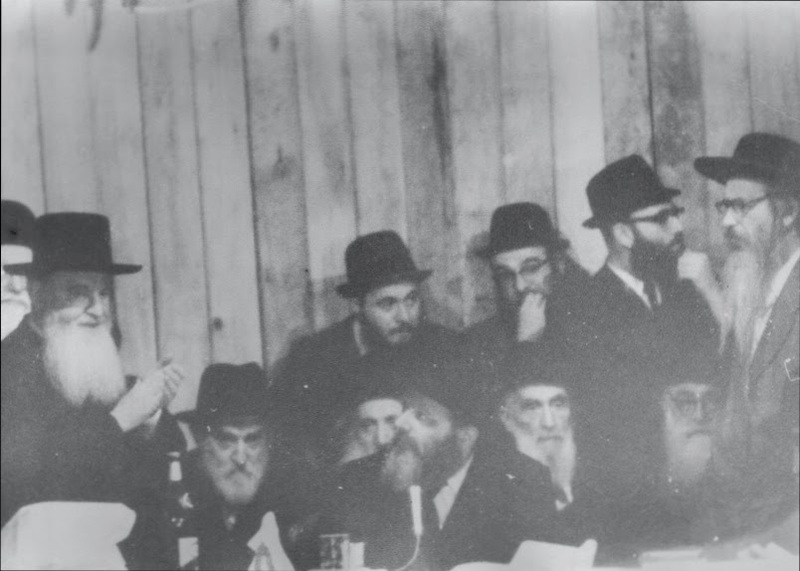 The first few are of the Rebbeyim of Lubavitch, and the last two are the late Reb Volf Greenglass of Montreal. Reb Volf was said to have kept a connection with Zalman at the request of the Rebbe. 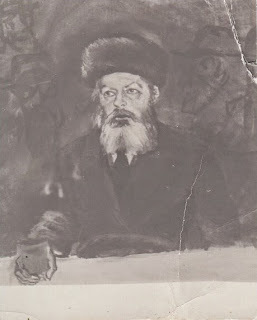 The Rebbe Rayatz in spodik is not rare, it's just high-quality here and בכלל a moyre'dige bild. Rebbe in Kolpik. Not sure if this Zalman's work or maybe Hendel Lieberman? 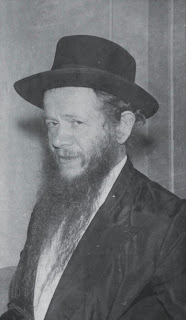 Kos shel brochoh, early '60s. 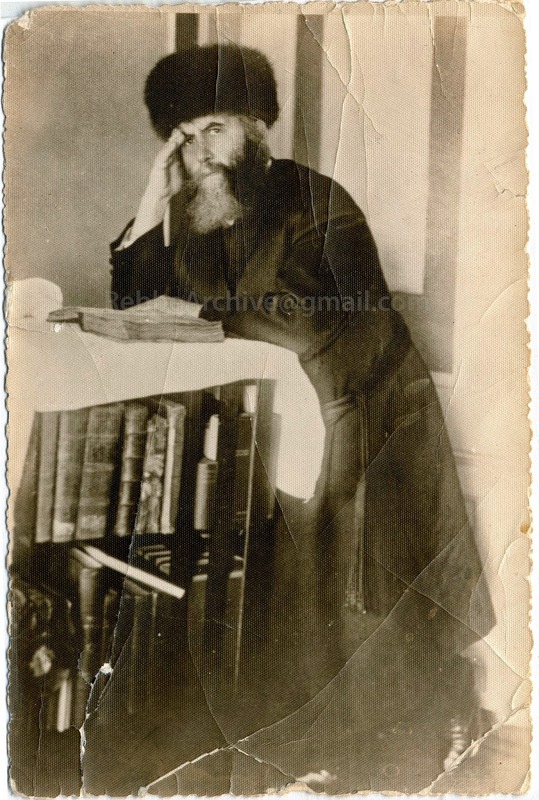 2 photos of Reb Volf. '50s.